It’s supposedly hackneyed to say that kids are our future. But hackneyed doesn’t necessarily equal wrong, and definitely doesn’t in this case. That’s why we have so many ongoing programs and special events aimed specifically at kids. That and it’s just so much fun watching them be enthralled and enthusiastic about science. Sheryl Loux and Pegah Jalili experimenting with enzymes and explaining how scientists record their procedure as well as the results. Kids are naturally inquisitive – show them the excitement of actually doing chemistry and you’ll have a rapt audience enthusiastic to learn more. That’s the simple concept behind Kids & Chemistry. Coupled with the fact that chemists love to show off their science, you have a formula that guarantees success. Since its launch in 1995, Kids & Chemistry has compiled an impressive record nationally. Many thousands of children have been reached with the program’s positive messages about chemistry. 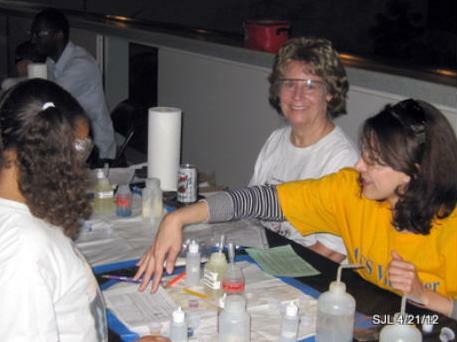 The St Louis Section’s program provides training for volunteers at the Saint Louis Science Center events held twice a year on a Saturday for Earth Day (April) and National Chemistry Week (October) and no experience is necessary. Activities are brought and set up by the coordinator for volunteers to share with children. Please email the coordinator to volunteer. The “Chemistry is pHun” program is one of the Section’s most popular outreach programs. Chemistry is pHun volunteers have historically presented hands-on demonstrations/workshops in classrooms for K-12 students based on well developed modules. The program has experienced significant change during the fall of 2016 and spring of 2017. 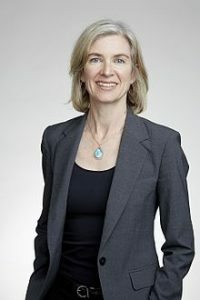 Sheryl Loux, who served with distinction for the past eight years and received the Section’s 2014 Distinguished Service Award, relocated to Michigan. Before her departure, she trained Will Ridley, who has continued the outreach program based in the elementary schools of the Rockwood School District. The solid foundation developed by Sheryl led to strong support from Cris Dames, Rockwood School District Partners in Education (PIE) facilitator, and productive working relations with 2nd grade teachers in the Rockwood elementary schools. During the academic year 2016-2017, Will Ridley presented the “States of Matter” program 21 times in 12 elementary schools to 926 second-grade students. In the “States of Matter” program solid, liquid, and gas states are explored, mainly of water, demonstrating the addition or release of energy in the form of heat when changing physical states. “Gluep”, a polymer made from Elmer’s glue and a borax solution is made to show a substance that has properties of both liquids and solids. Additionally, “Chemistry is pHun” recently presented a “Polymers are Marvelous Molecules” workshop as part of the Expanding Your Horizons Conference at the St Louis Community College-Florissant Valley. 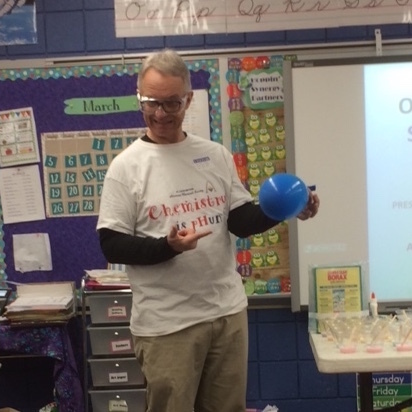 Will Ridley introduces “Chemistry is pHun – States of Matter” to a 2nd grade class, showing that gases qualify as matter since they fill space and have weight. Going forward, Melissa De Wever, President of the Chemistry Club at St Louis Community College (STLCC) Meramec, has suggested that the Chemistry is pHun outreach program expand into the elementary schools of the Kirkwood School District that is in close proximity to STLCC-Meramec campus. The program will need approval by the Kirkwood School District and agreement from the STLCC-Meramec chemistry students to help with the staffing. For the 2017-2018 academic year, “Chemistry is pHun” is seeking interested college chemistry students from throughout the St Louis area, working chemists who can spare an occasional half day from work, and retired ACS members with a desire to inspire and encourage an interest in chemistry-related science, technology, engineering and math (STEM) among elementary students. Training is available and a schedule should be completed for the next academic year by September, 2017. Please contact Will Ridley, Chemistry is pHun Coordinator, St. Louis Section of ACS, email: ridleywp@att.net, cell phone: 314-920-1507, for additional information. Since 2004, the St Louis Section of the American Chemical Society has organized a Chemistry Merit Badge clinic in conjunction with the Greater St Louis Council of the Boy Scouts of America. Hosted at the Jost Chemical Company, scouts are introduced to the four classical fields of chemistry, as well as chemical safety. They then rotate through four 45-minute stations (each run by two professional chemists), during which they make a Cartesian diver; learn about separations, MSDSs, abrasives, emulsions and mixtures; and take a tour of a working chemical manufacturing plant. During lunch, there are interactive activities and displays. Starting in 2011, a second clinic has been held annually in the eastern part of our Section, part of the Lewis and Clark Council. In 2012 a Girl Scout Science Night was added. It’s conducted in a local high school chemistry lab and meets the requirements for the Special Agent and Detective badges. Your 2017 Academy of Science – St. Louis Science Fair Winners!